In early August, Mitsui O.S.K. Lines, Ltd. (MOL; President: Koichi Muto) announced that the company has earned recognition from the ports of both Long Beach and Los Angeles, California, for its efforts to ensure compliance with standards that call for vessels to slow down within 40 nautical miles (nm) of the shore. 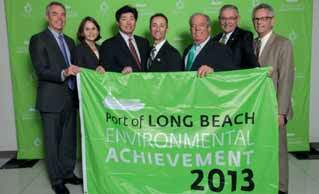 The Port of Long Beach introduced the Green Flag Program and Port of Los Angeles the Vessel Speed Reduction Program. The programmes urge vessel operators to slow down to 12 knots or less within a certain range of the ports to reduce emissions of carbon dioxide (CO2), nitrogen oxide (NOx), and sulphur oxide (SOx) in coastal areas to conserve coastal environment, and offer annual rewards to vessel operators that achieve extraordinary compliance percentages. Every year, a total of 250 MOL Group-operated vessels including containerships calling at MOL’s TRAPAC container terminal, as well as car carriers, tankers, and bulkers, navigate through the area covered by the speed standards. The ports have clearly appreciated the company’s efforts to comply with the programme and contribute to a cleaner coastal environment. MOL continually contributes to environmental conservation not only in this area, but also at other ports all over the world, and takes proactive environmental steps on a global scale.